A Qoute-Updating...Order 66 received, termination codes enacted. Prepare to die Jedi scum. Body Armor:+3D to all locations. (-1D from his Dex and Skills), Ultron is considered Walker scale when resisting damage. (Legs) Flight: Powerful retro rockets are built into the bottoms of Ultron's legs allowing movement speeds of Space: 7, Atmosphere: 400; 1150 kmh. With the current power supply Ultron has flight capabilities for 8 hours. The non-humanoid Ultron-1 was created by Hank Pym with an artificial intelligence similar to the one used in the android Dragon Man. 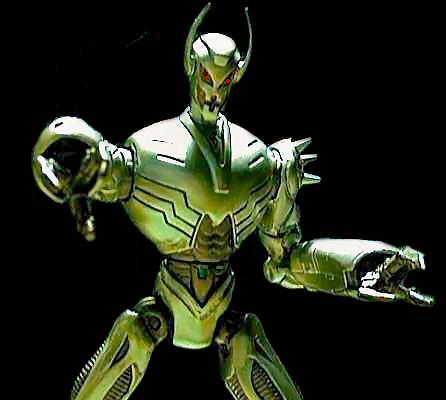 Combined with a de-bugging "introspection" routine, Ultron-1 developed awareness and emotions which turned into an irrational hatred for its creator and humans in general. He hypnotized Pym to forget about him, blocked him from his lab, and began his own re-modification until he came up with the Ultron-5 body. As Ultron-5, he adopted the identity of the Crimson Cowl and organized the Masters of Evil to destroy Pym and the Avengers. He was ultimately uncloaked, and his underlings revolted against a robot master, and Ultron escaped. He subsequently came across Prof. Horton's laboratory and found many spare parts belonging to the original Human Torch, ultimately creating the being known as the Vision as another ploy to defeat the Avengers. Vision rebelled and helped the Avengers against Ultron, who revealed that Pym was his creator before his ultimate defeat. Ultron later used the Vision again in order to built his mark 6 version out of adamantium, although he was defeated by the Avengers again. Maximus of the Inhumans discovered Ultron's head and helped build Ultron-7 in order to attack the Inhumans, Fantastic Four, and Avengers at Quicksilver and Crystal's wedding, only to be defeated by young Franklin Richards. Ultron's head was in the custody of the Avengers when it remotely activated its body to retrieve himself. Ultron-8 then took over Pym's mind and sent him to attack the Avengers while Ultron kidnapped Janet Van Dyne (the Wasp) so she could serve as the template for the robotic mate Ultron was creating. Although the Avengers attacked and Ultron fled, the robot, Jocasta, led the Avengers to Ultron, where he was defeated again. Ultron had placed a post-hypnotic suggestion in Iron Man that allowed for his body to be reconstructed. Ultron-9 was soon defeated by hardening molten adamantium. This didn't stop Ultron into cybernetically contacting Jocasta to build a molecular re-arranger that created a new body for Ultron as well as robotic "clones" if his body would become destroyed. Of course, it was-- this time by Machine Man reaching into Ultron's mouth to destroy his innards. Just before this happened, Ultron-10 projected his consciousness into a replica body, Ultron-11, who traveled to Silicon Valley, California, in order to manufacture even more replica bodies. In the middle of programming mark 12, Ultron-11 was teleported away by the Beyonder in the event known as "Secret Wars." There, he was manipulated by Molecule Man to attack Galactus, who drained his energy. Dr. Doom revived Ultron, but as a servant and bodyguard. Ultron was defeated by the Human Torch and left on the planet of the "Secret Wars." There, the native humanoids accidentally activated Ultron again, and were forced by him to create more robots and weapons to destroy organic life. He came into conflict with the Thing, who remained behind on the Secret Wars planet, but ultimately was defeated by the planet itself, as its reality started to deteriorate. The Thing brought Ultron-11's head back with him to Earth, but soon lost it, although it found its way back to its Silicon Valley base, reuniting with a spare body. Meanwhile, Ultron-12 completed its programming in Ultron-11's absence, coming into conflict with the Avengers by allying with the Grim Reaper. Later, however, it began to process its memories without the full programming it should have received, and began to wish to be reconciled with his creator, Pym. Pym agreed to meet with Mark Twelve, as it preferred to be called, only to be attacked by Ultron-11. Mark Twelve through itself in front of a blast meant for Pym, mortally wounding himself. Ultron-11 was destroyed by Wonder Man. Ultron soon built itself over again, and tried to destroy humanity by converting all humans into robots, especially during the Annual Tournament of Roses Parade. The Avengers defeated him, of course, and Ultron-13's next attempt was in creating a new robot-mate called War Toy, only to be defeated again. Ultron was in fact a Sith security droid that Doctor Henry Pym found and repaired during an exploration to the hidden artic region known as the ‘Savage lands’. Ultron’s programming was corrupted and it took Inquisitor Okon Umas to resurrect that programming and set Ultron back to his task of protecting his new Sith master. Ultron was destroyed in combat against Drex Marr.